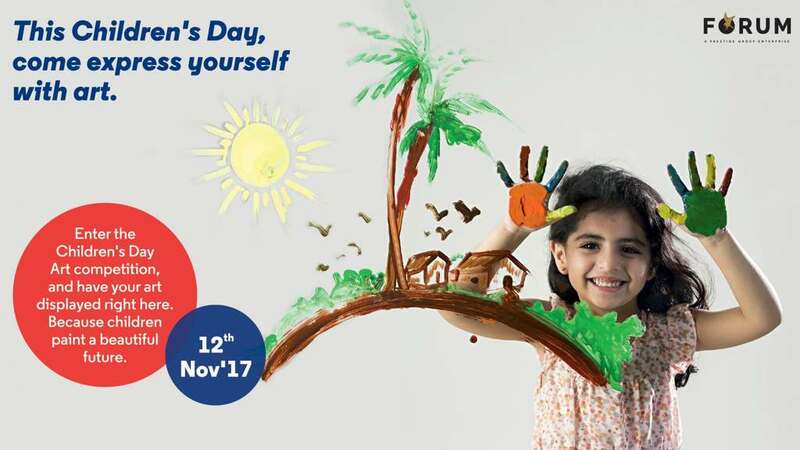 Forum Koramangala mall is organizing an Art Competition along with a Special Celebrity child appearenc of Aadhya Udupi on the occasion of Children's Day17. Nobody paints as beautiful a future as children do. Enter the Children's Day Art competition, and have your art displayed right here. Buy Bestselling Fidget Spinners for your kids! Buy bestselling Board Games for your kids - Monopoly, Scrabble, Pictionary, Battleship, UNO! Buy Bestselling Movie Merchandise for your kids - Star Wars Kylo Ren Lighsaber, Sphero, R2D2, Marvel's Thor Ragnarok, Hulk Mask! Buy Bestselling Trading and Playing Cards for your kids - Soccer Match Attax, Star Wars Rogue One, Pokemon, UNO Avengers, Boggle Slam!